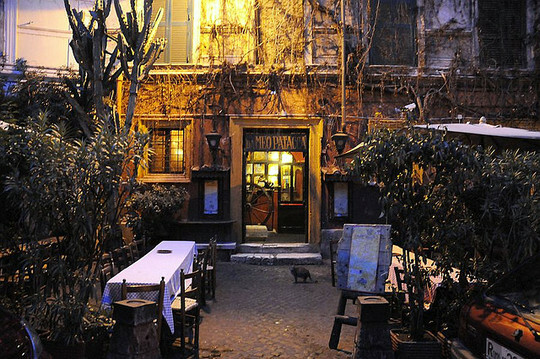 With the warm light of oil lamps and the flickering shadows from the candle flames, the courtyard of the restaurant Da Meo Patacca is one of the best places to dine in Rome, Italy. Located in Trastevere (Rome's coziest area), Da Meo Pattaca has welcomed several movie stars such as Sophia Loren, Marlon Brando, Charlton Heston, Kirk Douglas, Claudia Cardinale, and Brigitte Bardot. Wonderful. Have a tremendous Thursday. I soooo love this photo! It is exquisite! "Located in Trastevere (Rome's coziest area)" Errrrm. That's what the tourist board wants you to think. Just be very street-aware, walking round the area, OK?